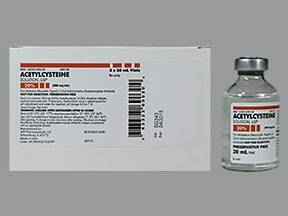 When inhaled by mouth, acetylcysteine is used to help thin and loosen mucus in the airways due to certain lung diseases (such as emphysema, bronchitis, cystic fibrosis, pneumonia). This effect helps you to clear the mucus from your lungs so that you can breathe easier. 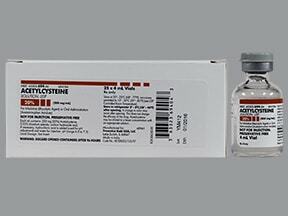 When taken by mouth, acetylcysteine is used to prevent liver damage from acetaminophen overdose. If you are using this medication to treat lung disease, inhale this medication by mouth as directed by your doctor. A health care professional will show you the proper way to use this medication. Learn all preparation and usage instructions. You may notice a slight odor when you first breathe in the medication. This odor will quickly go away. If you are using a face mask to breathe in the medication, there may be some stickiness on your face after use. Wash your face with water to remove the stickiness. 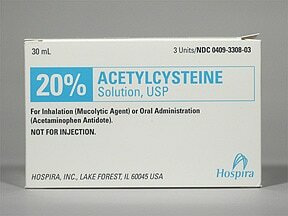 Do not mix acetylcysteine with other inhaled medications unless directed by the doctor or pharmacist. If you are taking this medication by mouth, take it as directed by your doctor. The solution is usually mixed with another liquid (such as cola) to decrease nausea and vomiting. Drink the medication within 1 hour of mixing. The dosage is based on your medical condition and response to treatment. For acetaminophen overdose, the dosage is also be based on your weight. 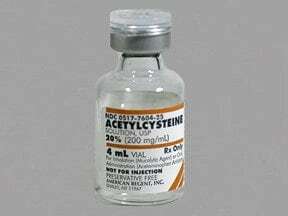 What conditions does Acetylcysteine 100 Mg/Ml (10 %) Solution treat? Nausea and vomiting may occur. Mouth sores and runny nose may also occur if you are inhaling this medication by mouth. If any of these effects persist or worsen, tell your doctor or pharmacist promptly. If you are taking this medication by mouth, tell your doctor right away if any of these unlikely but serious side effects occur: severe stomach/abdominal pain, black stools, vomit that looks like coffee grounds. If you are inhaling this medication by mouth, seek immediate medical attention if any of these rare but very serious side effects occur: chest pain/tightness, trouble breathing. 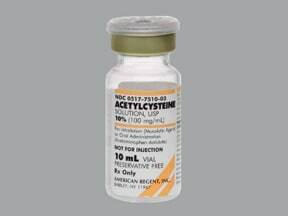 List Acetylcysteine 100 Mg/Ml (10 %) Solution side effects by likelihood and severity. 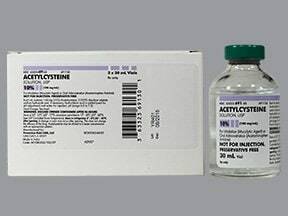 Before using acetylcysteine, tell your doctor or pharmacist if you are allergic to it; or if you have any other allergies. This product may contain inactive ingredients, which can cause allergic reactions or other problems. Talk to your pharmacist for more details. Before using this medication, tell your doctor or pharmacist your medical history, especially of: asthma, stomach/intestinal ulcer. 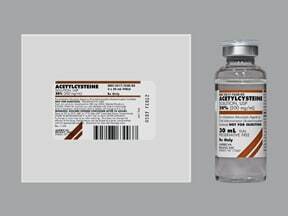 What should I know regarding pregnancy, nursing and administering Acetylcysteine 100 Mg/Ml (10 %) Solution to children or the elderly? 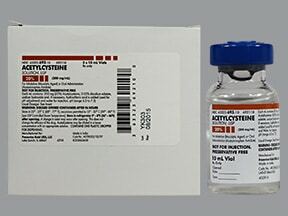 For acetaminophen overdose, laboratory and/or medical tests (such as liver/kidney function test, acetaminophen drug levels, blood mineral levels) should be performed periodically to monitor your progress or check for side effects. Consult your doctor for more details. If you are using this medication to treat lung disease and miss a dose, use it as soon as you remember. If it is near the time of the next dose, skip the missed dose and resume your usual dosing schedule. Do not double the dose to catch up. 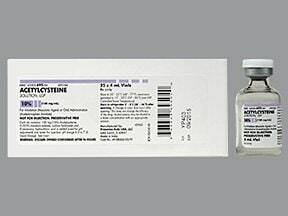 If you are using this medication to treat acetaminophen overdose, it is important to take each scheduled dose as directed. If you miss a dose, contact your doctor right away to establish a new dosing schedule. Store at room temperature between 59-86 degrees F (15-30 degrees C) away from light. 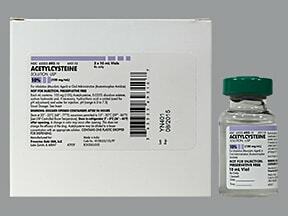 After opening the vial, store in the refrigerator between 35-46 degrees F (2-8 degrees C) and use within 96 hours (4 days). The solution may change to a light purple color. This is normal and will not affect how the drug works. Do not store in the bathroom. Keep all medicines away from children and pets. 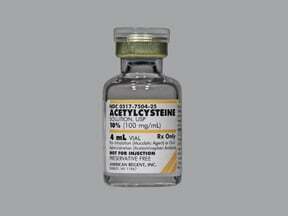 Are you taking Acetylcysteine 100 Mg/Ml (10 %) Solution? 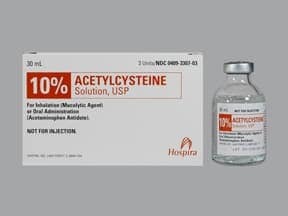 Are you considering switching to Acetylcysteine 100 Mg/Ml (10 %) Solution? 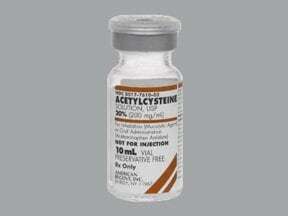 How long have you been taking Acetylcysteine 100 Mg/Ml (10 %) Solution?